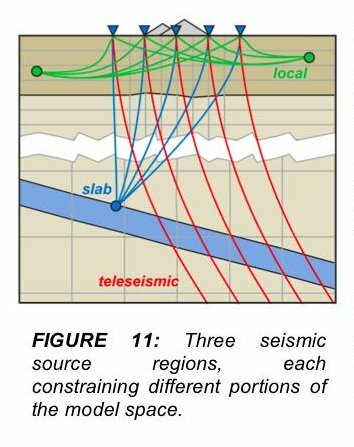 Seismology is the study of earthquakes and how earthquake waves move through the Earth. Seismology is a technique used to 'image' the interior of our planet by recording waves generated by earthquakes. These waves are created by shifting or cracking subsurface rock. Before eruptions occur, magma motion causes many small earthquakes, which are recorded by seismometers. How do we install seismometers? Installing seismometers in remote volcanic regions is hard work! The sensor must be buried several feet underground to isolate it from surface noise, such as high winds. A computer for recording data must be installed, and everything must be attached to a solar panel for year-round power. All the equipment must be well protected from foraging animals and the extreme weather conditions of mountainous environments. Because seismic waves travel slower through magma compared to solid rock, it is possible to determine where magma is based seismometer measurements. After analyzing several years of seismic data, a subsurface map of Uturuncu can be made that shows the depth and geometry of its magmatic plumbing system. Estela Minaya is the current director of the Observatorio San Calixto in La Paz, Bolivia which runs the national seismic network. The center was founded in 1913 by Jesuits. Mike West and Steve McNutt are volcano seismologists who work at the Alaska Volcano Observatory and the Department of Geology and Geophysics at the University of Alaska, Fairbanks. Doug Christensen is a seismologist in the Department of Geology and Geophysics at the University of Alaska, Fairbanks.